If you’re at all familiar with The World Happiness Report, which measures the happiness of people living in 156 different countries, you’ll know Denmark maintains a consistent spot on the podium. This year, the Nordic country is down one to #2 in the ranks, but as Boston Globe correspondent Jessica Teich observed, the Danes are too busy being happy to care. Out-joyed only by their Norwegian neighbors (and by statistically insignificant disparities, according to the report’s co-editor John Helliwell), these bike-riding, nature-loving, raincoat-donning people have evidently grasped the H in the FRESH acronym. And what of the F-R-E-S? I’ve only been here 5 days, yet I’m confident enough to promise the Danes don’t disappoint. Food was never going to be the disqualifier here. Denmark’s capital, Copenhagen, was home to the World’s Best Restaurant in 2010, 2011, 2012 and 2014. But “Best” doesn’t necessarily signify healthy, you say, and I applaud your playing of Devil’s Advocate. After all, New Yorkers learn that best doesn’t even mean best simply by counting the number of storefronts boasting “New York’s Best [Insert Generic Food].” But Denmark takes care with local, sustainable, seasonal food -- FRESH as can be. And let’s face it, Americans probably consume more not-so-nutritious Danish pastries than anyone. Vegetables raising the roof at ØsterGRO in Copenhagen. Photo by Carly Brand. Relaxation proves to be another of Denmark’s FRESHialties. In the months before I moved here for university, I received not an inkling of information regarding an academic calendar or class schedule. Then, just as I doubted my ability to wait any longer, I received a few emails from administrators to inform me they were setting off on 3 week “holidays.” Speaking with a local, he told me this period of time off was “basically mandatory” and that employees typically have 5 weeks of paid vacation time, plus 9 days for public holidays. Meanwhile, the United States comes in hot with a whopping 0 paid vacation days required by law. Exercise, from what I can see, congregates on designated bike paths. At FRESH, we talk a lot about the characteristics of Blue Zones - places where an unusually high percentage of people live to be 100-years-old. According to the research these pockets share distinct commonalities, one being that they Move Naturally. “The world’s longest-lived people don’t pump iron, run marathons or join gyms,” says New York Times best-selling author Dan Buettner. 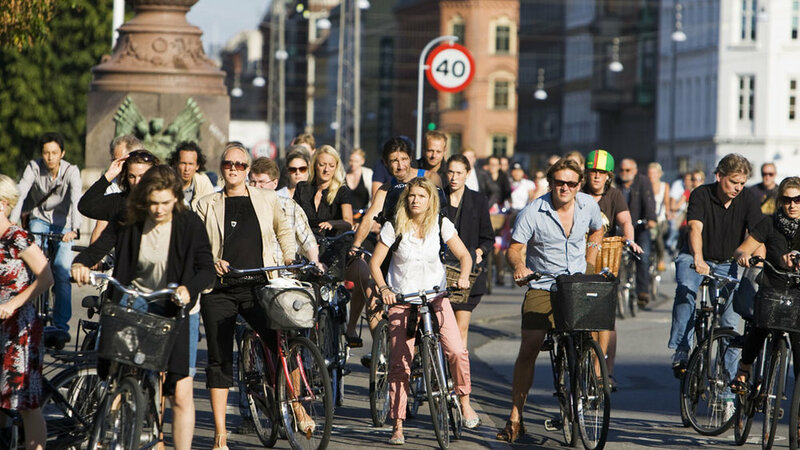 “Instead, they live in environments that constantly nudge them into moving without thinking about it.” And that’s exactly the phenomena I am witnessing in Copenhagen, as infants and elderly alike cross the city by bike. Rush hour in Copenhagen. Photo by VisitCopenhagen. Sleep is hard to measure, though I can say I’ve had none of it since I’ve been here. It’s all too exciting! Though what I will say is I can’t imagine Danish people are losing much of it over financial concerns. That’s not to say they don’t have them -- Of course they do. However, in stark contrast to U.S. citizens, the Danes suffer no anxieties about the costs of healthcare or higher education, it’s all “free!” As much as an income tax above 50% can be called free. But all the locals I’ve asked agree: They’d rather be taxed than stressed and sleepless. Happiness, then, is not a finite resource in Denmark. And, unsurprisingly, the U.S. wants in: Stroll into your local bookstore and on the shelf of best-sellers you’ll find one or two dedicated to what many call the source of it all: Hygge. The Danish word is (probably) pronounced “hoo-ga” and is, as explained to me by a delightful 14-year-old local, “the feeling of being comfortable and happy with people you feel close to.” It’s reminiscent of Christopher Peterson’s mantra, which Julie often repeats: Other People Matter to our happiness. Hygge making itself comfortable on bookstores across the world. Photo by Grace McManus. I woke this morning without any of this on my mind. Instead, I felt lonely in this “happy” new home of mine. But against my sleepy Sunday instincts, I laced up my sneakers, plugged in my headphones and leapt down the stairs of my new apartment building. As soon as I stepped onto the sidewalk I halted; It was raining. After a moment’s hesitation I set off, feet pounding puddles. The streets buzzed with people not bothered by a light drizzle, even as drizzle became downpour. As I ran, I thought about the joy in viewing little adversities as little adventures, and a few miles later I’d set a personal record. After washing everything anew the rain stopped, too, and it left the world looking a little more FRESH. Carly is a writer and marketing assistant at FRESH Med NYC, originally from Boston but currently living in Copenhagen to study Global Nutrition & Health. She first connected with Julie and Dr. Graham after creating her own college major at the University of Massachusetts Amherst based on their really-freakin'-awesome work. She's always free to talk at carlybrand11@gmail.com.